Storing water in below ground rainwater tanks is the best solution for many domestic rainwater systems. Water stored below ground helps maintain a more stable, cool temperature; it also stays sheltered from sunlight, which inhibits the growth of algae, keeping your water fresh and clean for longer. Supplied with or without a built-in filter, our flat underground tanks are a shallow design and can be installed with no concrete and very little fuss. 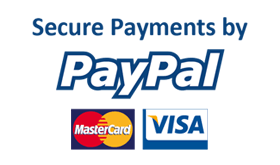 Get in touch with us if you want our help making the whole process go smoothly. 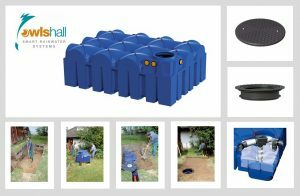 Whether your below ground tank has a filter pre-installed or not, it’s always advisable to filter the water, removing leaves and debris prior to storage, which is something our rainwater filter products can help you with if you need to buy a separate component. At Owls Hall, we want you to have complete confidence in the product you’re buying. That’s why all of our below ground rainwater tanks come with a 25-year warranty. They’re relatively easy to install by yourself, but give us a ring on the number at the top of the page if you’d rather bring in some expert help to oversee the job. The F-line 1500L flat tank, with lockable cover and shaft is one of the most popular tanks in the UK. 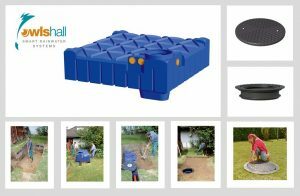 With its 25 year warranty, sump for pump location, and childproof lock, the flat tank from Owls Hall Environmental is the right choice for your water storage needs. The F-line 5000L Filter tank, with pre-installed leaf filter and calming inlet, child proof locking system and 25 year warranty, it’s clear why this is our most popular tank. The F-line 7500L flat tank, with lockable cover and shaft is one of the most popular tanks in the UK. 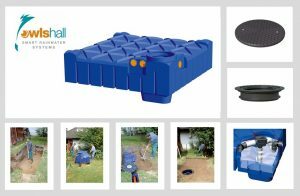 With its 25 year warranty, sump for pump location, and childproof lock, the flat tank from Owls Hall Environmental is the right choice for your water storage needs. The F-line 7500L Filter tank, with pre-installed leaf filter and calming inlet, child proof locking system and 25 year warranty, it’s clear why this is our most popular tank.